Poodleism: Blanch Devereaux, you're my hero. Sweet, sweet Blanche Devereaux of the Golden Girls isn't with us anymore. If I had to be any of the Golden Girls it would most definitely be sassy Blanche. She was man-happy, witty, gorgeous and loved her some 1980's powersuits. I can only hope that I'll be keeping it real with my best buddies as a post-menopausal lady. 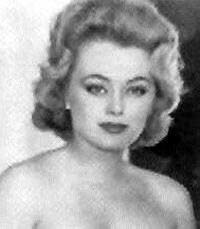 The actual actress, Rue McClanahan, died early this morning of a stroke. Sadly it was her second this year. After doing a little more research, I learned she began her career on Broadway in the 1950's, but Golden Girls is really what put her on the map. Shame, she was a raving beauty back in the day: The Florida home that the Golden Girls lived in was owned by Blanche and her late husband....so I guess we have Mrs. Devereaux to thank for all of the show's 7 years (probably more like 30 if you count the syndication) of goodness. Now, Betty White is the only one of the Golden Girls alive. And she's enjoying a much-deserved career renaissance these days. She's 88 years old! I love sweet Betty White, but I can't help but think she should slow down a tad. Long live the Golden Girls in late night television infamy!